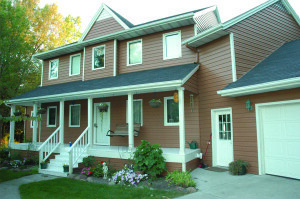 Metal siding products from DuBois ABC Seamless offers unsurpassed protection for homeowners in or near Minneapolis, Minnesota, who want to shield their homes from the elements and impact damage. We have served homeowners in the region since 1980, offering extraordinary exterior renovation projects installed by highly trained specialists. Our seamless metal siding is second to none, providing an exceptionally attractive visual presentation, extraordinary protection from damage, and unequalled insulation to help reduce your energy costs. Our professional installers will fabricate your new metal siding on site, using the precise measurements of your Minneapolis home. Our method eliminates the unsightly seams that occur when exteriors are finished with lower-quality products. With DuBois, you get a sleek, streamlined exterior that will instantly improve your home’s curb appeal. Plus, because we engineer our siding out of steel, you won’t ever have to worry about rotting or cracking – problems that are common with wood or vinyl siding. And our extraordinary finish coating means your new siding will never need to be painted, unlike wood or fiber cement siding, which need attention every few years. Finally, with a base layer of thick, foil-backed insulation under those ribbons of steel, you can be sure that your home is wrapped in the finest weather barrier available, making it easier for your HVAC to maintain a comfortable indoor temperature all year long. By reducing the workload on your heating and cooling system, you’re sure to see energy savings over time as a result of your new siding. To learn more about the metal siding products we offer for homeowners in or near Minneapolis, MN, contact DuBois ABC Seamless today.